I could never make those chains of paper people growing up, I'd always concentrate on getting the folds right then somehow after the chopping I'd end up with a half a dozen sets of couples and have to get out the sellotape rather than unfurling a nice chain of hand holders! It felt like a fairly momentous moment to turn out a little chain of hearts a couple of days ago, so I thought I'd take a picture or two for posterity, Mum will be proud! I've been collecting old books, stamps, scraps of wrapping paper and old postcards for a while now as I much prefer to recycle than buy specific card embellishments, I've also been giving altered art a whirl - very much a beginner there though! 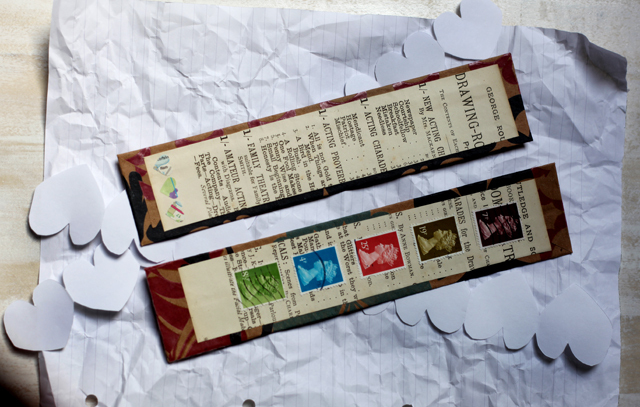 I made a couple of bookmarks I planned to give to the Mums this Mother's Day, but naturally, completely forgot to pack them in the parcels before posting. The back view of the bookmarks - they're made from strips of cereal packet wrapped in leftover Paperchase wrapping paper, then a strip of text and some butterflies made from pages that fell out of an old book I have. 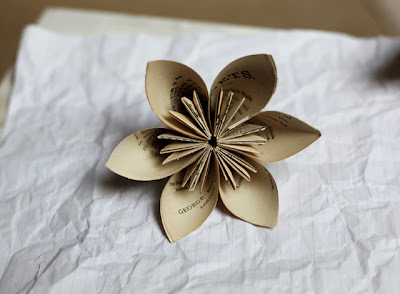 The one thing I remember vaguely from Origami club at primary school is how to make these paper flowers - the mood struck after I'd finished the bookmarks and made a cup of tea so I cannibalised a couple more pages from the already dead book and tried to recall exactly how to do the folds. They're a little wonky and imperfect but I have the paper craft bug once again so I'll be fine tuning and experimenting with different papers in the next few weeks. these are great makes Jem I love them! Oh I love those book flowers, my stash of sheet music paper would be great for them. Do you fancy doing a tutorial or is it too complicated? I can make lillies out of paper, but that would be fiddly to show the steps on camera. 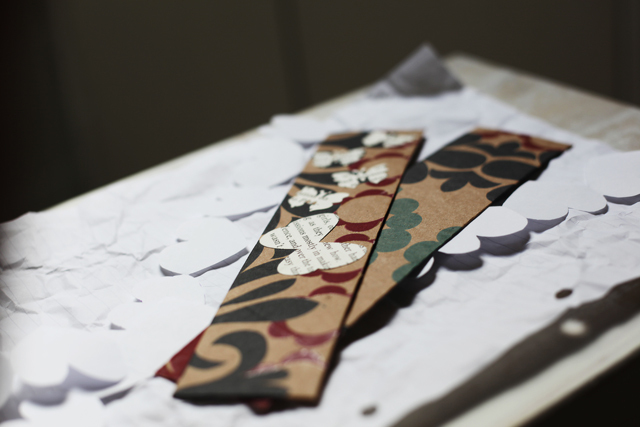 Oh wow ~ your paper flowers are gorgeous! 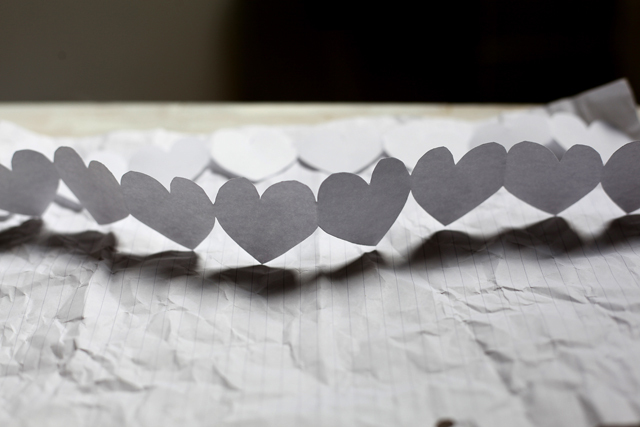 Funny, I was really impressed with the paper hearts - teehee - really, I was. But these flowers are amazing. really pretty. How did you fold them? 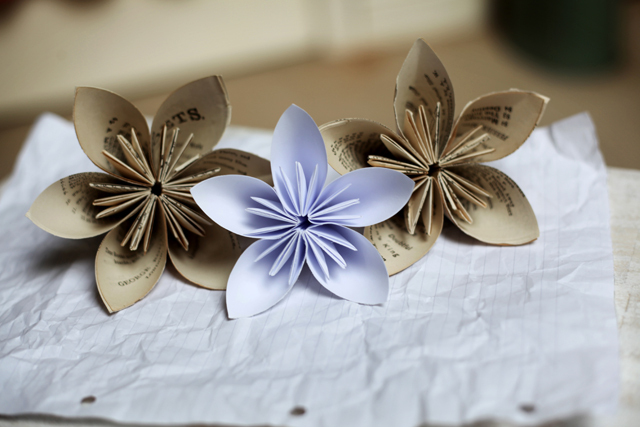 You have a beautiful blog and these origami flowers are just amazing! It's so great that you had an origami club at school-I can't even imagine having anything similar when I was in primary.Your flowers are so beautiful and I'm with the others in pleading for a lesson. Jem: These are beautiful. And you did a perfect job with them. Yes, please a tutorial. Thanks for following my blog from so far away. jem, bardot in a bottle - what an incredible product that would be! These are really great! I would love to do some of these. Thanks for linking up at I Made It! Monday at Ninth Street Notions. I can't wait to see what you have this next week!